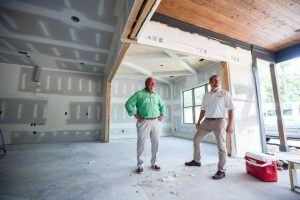 Dwight Sandlin, left, and Jonathan Belcher, right, survey the construction of a model home in the Blackridge development in Hoover. The pair has built many of the new neighborhoods in Hoover, as well as several others in Helena, Trussville and down the U.S. 280 corridor. If you know someone who bought a new house in Hoover in the past 10 years, there’s a large chance that house was built by Signature Homes. The company, which entered the Hoover housing market in 2000, has dominated home building in Hoover every year since 2006. In the past 10 years (2008 to 2017), there were 3,196 houses built in Hoover, and Signature Homes built 61 percent of them, according to a Hoover Sun analysis of building permit records on file with the city. That’s nearly two out of every three houses built. Since the start of 2015, Signature was responsible for more than 70 percent of the houses built in Hoover, records show. In 2016, there were 354 houses built in Hoover, and Signature built 256 of them. The second most productive builder that year was Embassy Homes, with 30 houses. From fall 2000 to the present, Signature has built about 2,750 homes in Hoover. Company officials say their average sale price over that time is about $336,000, which means Signature is responsible for roughly $926 million worth of houses in Hoover at the point of sale. With appreciation, that’s more than $1 billion worth of housing. About half of those 2,750 homes were in Ross Bridge, representing about 70 percent of the single-family homes approved in the Ross Bridge master plan, Signature President Jonathan Belcher said. But the company’s homes are spread all across the city, from Southpointe off South Shades Crest Road to Trace Crossings, The Grove, Chapel Creek, Chace Lake, Kirkman Preserve off Caldwell Mill Road, Inverness and Greystone. So how does one company come to such dominance? Local industry observers say it’s a mixture of land availability, good market research, good relationships with land developers and a commitment to developing quality neighborhoods and houses. But to fully understand how Signature Homes got to where it is, it helps to reflect on the company’s origins. 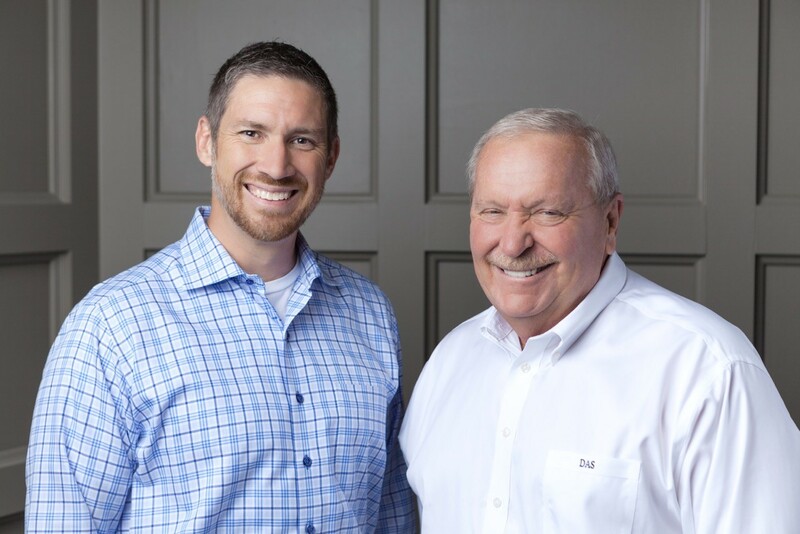 Signature Homes was founded in 1998 by Dwight Sandlin and Jonathan Belcher. Sandlin, the company’s CEO, formerly worked as head of construction lending for the Bank of Boston in Jacksonville and in 1987 moved back to Birmingham to start a high-production home building company called Regency Homes. Sandlin said that, at that time, there was nobody in Birmingham building more than 10 or 20 homes per year, but he had seen high-volume home building work in other markets and decided to duplicate it here. Belcher came to work for him at the age of 20 — repairing sod and sweeping houses and streets — and worked his way up in the company. D.R. Horton, one of the largest home construction companies in the country, bought Regency Homes in 1995. Sandlin and Belcher continued working for D.R. Horton for three years before breaking away in December 1998 and forming Signature Homes. Due to a non-compete clause that kept them from building homes within 100 miles of Birmingham until 2000, Sandlin and Belcher started the company in Baton Rouge. Their first development was a 240-home subdivision called Manchac Place in Prairieville, and their first home sale closed in July 1999. Sandlin and Belcher continued working in Baton Rouge but came back to the Birmingham area and started building a few homes around Hoover in 2000. Their first full development in the Birmingham area was 67 homes in the Eagle Trace section of Eagle Point in north Shelby County, which started in 2001. In Hoover their first full development was a set of 80 homes in The Haven of Greystone, with home sales starting in 2003. Signature Homes CEO Dwight Sandlin talks about his company’s partnership with Alabama Power Co. to provide energy-efficient homes in the Reynolds Landing neighborhood in the Ross Bridge community, with electricity partly provided by the microgrid power system behind him. More developments followed, and Signature now has built more than 2,700 homes in Hoover, city records show. Signature also builds homes in Chelsea, Helena, Liberty Park and Trussville and expanded to Huntsville in 2006 and Nashville in 2011, Belcher said. In total, the company has built more than 6,500 homes and created more than 100 communities, he said. Signature left Baton Rouge in 2005 when land prices skyrocketed after Hurricane Katrina and it no longer made sense to make investments on land with temporarily inflated prices, Sandlin said. The national housing crisis began to show in 2006, and as home prices fell due to an overabundance of supply, many home builders went out of business. The total number of single-family home building permits issued in Hoover fell from a high of about 900 in 2005 to 279 in 2008, records show. Signature managed not only to stay in business but to thrive, and the company quickly rose to the top of the list of home builders in Hoover, far outpacing others. How did Signature do it? Sandlin said he, Belcher and their team do a lot of market research before making decisions, studying both local and national housing markets and overall economic trends. Understanding the intricacies of supply and demand are key, Sandlin said. He and Belcher realized in 2006 that the housing crash was coming and positioned themselves to weather the storm, he said. They had a year’s worth of inventory and started to reduce prices in October 2006, he said. He and Belcher focus their research heavily on job growth in a region to help determine what the demand for housing will be, he said. If employment is on the rise, demand for housing will increase, Sandlin said. The Birmingham-Hoover job market has been rather stagnant, holding down demand, but the trend lines are beginning to improve, showing promise for the future, Sandlin said. Mike Wood, a retired home builder who is chairman of the Hoover Planning and Zoning Commission, said one reason Signature Homes has controlled so much of the housing market in Hoover in the past decade or so is because land is much more scarce than it was in the past. Plus, the housing crisis put so many builders out of business and changed the mindset of bankers toward developers, Wood said. In 2000, there were about 150 different builders that received permits from the city of Hoover to build single-family homes, but by 2017, that number had dropped to 29, records show. A labor shortage for people with construction skills also has made it difficult for home builders, Wood said. Scott Underwood, another home builder with Prominence Homes and Centennial Homes, said there are other good home builders in Hoover, but Signature Homes has been able to acquire a lot of the available land, and the company both develops the lots and builds the homes. “They’ve got the lots, so they get the sales,” he said. The Lake Wilborn community is one of the newer subdivisions being built by Signature Homes in Hoover. Part of their success is just simple economics, Underwood said. Signature Homes also has developed good name recognition that is working well for the company, he said. Alicia Vincent, executive vice president for the Greater Birmingham Association of Home Builders, said Signature has forged good working relationships with developers and landowners in Birmingham. “They have the resources and financial ability to purchase large lots at one time and can build quicker,” she said. Signature’s grip on the market in Hoover is unique but not unheard of, Vincent said. There are other cities where a certain developer dominates, she said. “Tower Homes is pretty much the only builder in Irondale and has been for years,” she said. But the housing market in Irondale is also much smaller. Signature Homes has figured out a niche in Hoover and is sticking with it, she said. “Maybe they understand the people of Hoover and what Hoover’s mission is,” she said. Signature at times has been accused of buying preferential treatment from city officials with campaign donations, but Sandlin and Belcher said that’s not true. Sandlin said Signature has never had a public official in Hoover demand a campaign donation in order for Signature to get approval for a development and Signature hasn’t asked for any special treatment. He said the company is successful in Hoover because it does its homework before taking a project for city officials to consider. Wyatt, head of the building inspections department, said both Sandlin and Belcher are dynamic people who have a reputation for working with existing neighborhoods and offering compromises to get support for new communities. “They’re very responsive, Johnny-on-the-spot really, working with existing neighborhoods,” Wyatt said. Belcher said he and Sandlin make no apology for making political donations to candidates whose platforms they support. “It’s no different than a vote,” he said. But Sandlin noted that “we backed the wrong horse” in the most recent mayoral election. Sandlin and Belcher each gave $2,500 to the campaign of former Mayor Gary Ivey, who was defeated and replaced by Frank Brocato in 2016. Belcher said he and Sandlin did not support several City Council candidates who ran on a platform of no growth. He and Sandlin said they believe Hoover needs growth to remain a healthy city. “It doesn’t have anything to do with decisions that they make for us, per se,” Belcher said. If anything, Signature is held to higher scrutiny because it is a big company that does big developments, Belcher said. A lot of people like to blame Signature Homes and other home builders for problems associated with the city’s growth, but builders don’t create the demand for new houses, they just respond to it, Belcher said. Most people tend to forget that Signature has revised plans for land that reduced the number of homes to be built in the city by more than 3,000 homes, Belcher said. Those adjustments have allowed the Hoover school board to delay the need for a third high school, he said. Hoover has a built-in governor that is restricting growth: the lack of available land in the city limits, Belcher said. U.S. Steel still has some land to develop in The Preserve, and Embassy Homes is still building some houses in Lake Cyrus. D.R. Horton recently won approval to build up to 170 town homes on Old Rocky Ridge Road near Interstate 459. As for Signature Homes, it still has about 45 lots to develop in the Glasscott sector of Ross Bridge, as well as about 46 unallocated Ross Bridge housing units, Belcher said. Signature also has about 75 homes to build in Brock Point near Greystone, about 1,000 residential lots left in Trace Crossings and about 1,000 lots in Blackridge. The latter two together are about the size of Ross Bridge, and Ross Bridge took 13 years to develop, Belcher said. Signature is just in the second year of those developments and expects build-out to take another 8 to 13 years, he said. U.S. Steel still has 1,944 residential lots left to develop on the Trigger Creek property south of Shelby County 52, and Signature is not looking to acquire that land at this point, Sandlin said. Signature did have an option to purchase 840 acres of unincorporated land next to Ross Bridge owned by Concetta Givianpour, which would have accommodated 1,500 homes, but that option has expired, Sandlin said. Vincent said she’s always excited when Signature Homes participates in the Parade of Homes because the company offers unique amenities in its neighborhoods such as wiffle ball fields, parks, playgrounds, walking trails and even a canoe launch. Belcher said it’s all about creating a sense of community. When people are deciding where to buy a house, they look at three things. They first look at the area of town and then for a community that fits their style. They consider the actual house last, he said. Signature goes to great lengths to keep its communities well maintained and to develop ambiance for the neighborhood, Sandlin said. “If the community looks bad, it doesn’t matter how good the houses look,” he said. He loves sitting on his porch in Ross Bridge at Christmas time and seeing the annual golf cart parade. One of his favorite pastimes is watching more than 20 teams enjoy the wiffle ball fields Signature built. Andy Anderson and Jimmie Johnson III helped with research for this story.